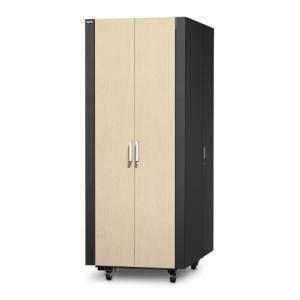 NetShelter CX is a specialized enclosure with integrated cooling, noise dampening, and power distribution for server and network applications in office environments. Provides customers with easy accessibility to equipment. Easy cable access near the rear of the IT equipment. Provided with a rack power distribution unit servers and other equipment are ready for deployment. High efficiency fan modules remove heat and eliminate the need to purchase a costly cooling unit for your IT equipment. Provides multiple mounting locations for cable management accessories and rack PDUs without using critical equipment space. Leveling feet can be quickly adjusted through the use of a screwdriver or drill, eliminating the need to reach underneath with a wrench. Enclosures are shipped standard with both leveling feet and castors.